The TDP mineral lamp is a type of far-infared therapy. Often called the “Miracle Lamp”, as it helps with pain relief and treats an assortment of ailments including back pain, arthritis, shoulder and joint pain among others. 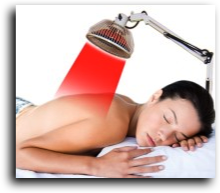 Infrared heat lamp therapy is something we all experience in the form of sunlight. While we can all see the visible light, the heat that you feel when you are out in the sun and your skin is warmed comes from the infrared light rays. This far infrared heat coming from the sun is not dangerous to your skin like the ultraviolet light rays are. Infrared light has been shown to be beneficial to health which is why many people are interested in infrared heat lamp therapy. Infrared heat therapy emits infrared radiant heat which is absorbed directly into the body. The infrared heat activates and ionizes water molecules in the body and helps to increase blood circulation, stimulates the production of collagen, and rid the body of toxins as well as many other health and beauty benefits. Because TDP lamp therapy penetrates deep into muscle tissue, it is often used for pain relief. Arthritis sufferers can greatly benefit from heat therapy as it decreases the stiffness in the joints. Athletes can also benefit by using it on sore muscles, inflammations, and to reduce muscle spasms. In addition to relieving pain, it also increases muscle and joint flexibility. The TDP lamp or TDP mineral lamp is a medical device that has clinical evidence confirming that it can reduce inflammation, calm pain, and improve micro-circulation, and balance metabolism. Evidence was gathered substantiating TDP mineral lamp use promoted cell growth, reproduction, and repair, concurrently with promotion of specific enzyme activity levels and immune function. Unlike other conventional far infrared lamps, a TDP lamp contains a curing plate. The curing plate, the key component for a TDP lamp, is coated with a proprietary mineral formation consisting of 33 elements essential to the human body. When the curing plate is heated to a certain temperature, it emits unique bio-spectrum electromagnetic waves in 1-25 microns allowing for a maximum absorption into the human body. The absorbed energy promotes microcirculation and metabolism, strengthens the immune system, and achieves short- and long-term pain relief. In the past 16 years, TDP lamps have been used to treat millions of patients with various chronic ailments worldwide. In China, people refer to the TDP lamp as the “Miracle Lamp” due to its incredible success in treating chronic ailments.